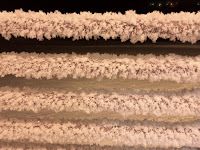 The wind finally died down last night and this morning, the frost on the metal railing looked pretty cool. The sodium vapor lights mounted on the outside of the building gave it a weird orange cast. And since it was a jpeg and not a raw photo, I couldn't simply change the white balance. No trees around here to get covered with frost just the buildings, vehicles and other man-made surfaces. Lacking vegetation, the only "natural" surface is ice. I think I finished all of the tasks that I needed to do while in Barrow on this trip. There are a number of things that I could only do while up here. Hard to do a lot of things remotely. I had set the GoPro up again on Friday just in case it turned out to be clear but there was a lot of blowing snow. So I didn't bother uploading the video. On Saturday afternoon, I arrived back home but didn't feel like riding. But on Sunday afternoon, there was a little time for a short ride. After all, had to see if the Ural still started. That was PBC #28. Happy New Year Richard! What a cheery little song! Can't adjust the WB in the camera? I say that like I do it all the time, I don't but it seems to be a standard feature these days? Maybe if I actually used a real camera. And even then, Sodium vapor lights are not the same color as regular incandescent. I used the standard iPhone camera app. Camera+ has a WB setting but I didn't think about it. "Lacking vegetation, the only 'natural' surface is ice." - That is a great statement. Love the frost photo. Welcome to the tundra! All of the vegetation is very low to the ground with no trees or bushes. The frost looks cool and when it's on trees, it gives the landscape a very Dr. Zhivago-Ish look. Wow, that ice crystal picture is really cool. Nice capture. Thank you! I like it when the frost has that look. Is that frost at all typical? I would have guessed the combination of temp and moisture wouldn't have been rich enough. 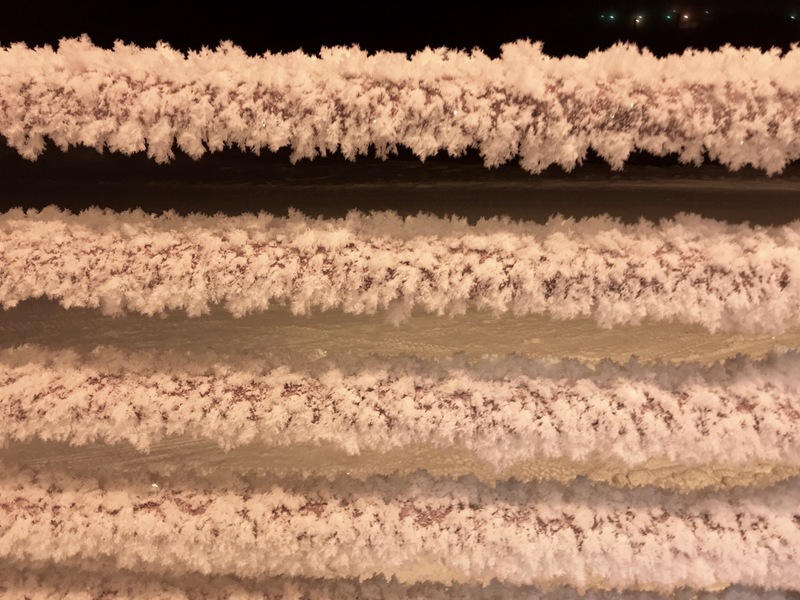 The frost is pretty common in Fairbanks but I haven't noticed it in Barrow before though I'm they get it when the conditions are right (no wind). Nature is such an artist - I love it when everything is covered with frost, everything that is except my car. We have that kind of frost here today. I think it's called "hoar frost".